All auction prices listed are for general reader interest only, and are shown in this order: $ (USD)/ £ (GBP). All prices listed are Hammer Price (the winning bid amount) unless noted as Premium, indicating that the figure quoted includes the Buyer’s Premium of an additional percentage charged by the auction house, as well as taxes. As of 1940, there were forty-three oil paintings by James Tissot in public art collections worldwide: sixteen in the U.K., eighteen in France, three in the U.S., one in Canada, one in India, two in New Zealand, and two in Australia. Interest in James Tissot’s work continued into the years during and after World War II, and museums in England, Ireland, and the U.S. acquired four more of his canvases in this decade. Portsmouth Dockyard was owned successively by Henry Jump (1820 – 1893), a wealthy Justice of the Peace and corn merchant living at Gateacre, Lancashire; James Jump, Ipswich, who died at 50 in 1905; and Captain Henry Jump, Heytesbury. Captain Jump sold the picture at Christie’s, London, in 1937 as Divided Attention. It was purchased by Leicester Galleries, London, for 58 guineas, and sold to novelist Sir Hugh Walpole (1884 – 1941), London. Walpole had just been knighted, having returned from Hollywood, where he wrote two screenplays for David O. Selznick: David Copperfield (1935), in which he had a bit part as the Vicar of Blunderstone, and Little Lord Fauntleroy (1936). Walpole also was an art collector who left fourteen works to the Tate and the Fitzwilliam Museum in Cambridge. Portsmouth Dockyard was left to the Tate by Walpole upon his death in 1941. It is not on display. 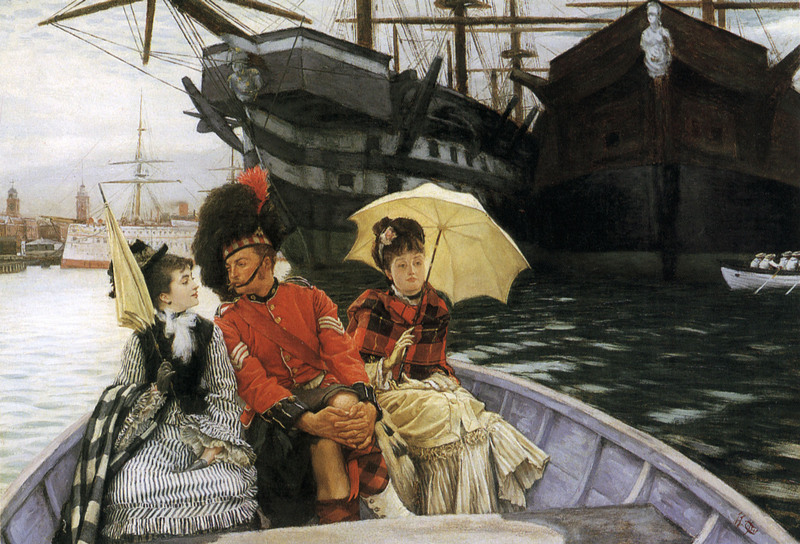 The following year, an older work by Tissot became accessible to the public at the Hermitage Museum in Norfolk, Virginia. Marguerite in Church (1865) is one of Tissot’s early works, when as a young artist he imitated the work of the popular Belgian painter Hendrik Leys (1815 –1869). Leys’ painting, The Trental Mass of Berthal de Haze – replete with numerous characters enacting a historical drama against a detailed architectural background – won a gold medal at the 1855 Paris International Exhibition. In 1859, Tissot traveled to Antwerp, augmenting his art education by taking lessons in Leys’ studio. Of the six paintings by Tissot accepted for the 1861 Salon, three were based on Goethe’s Faust: The Meeting of Faust and Marguerite, Faust and Marguerite in the Garden, and Marguerite at the Service. 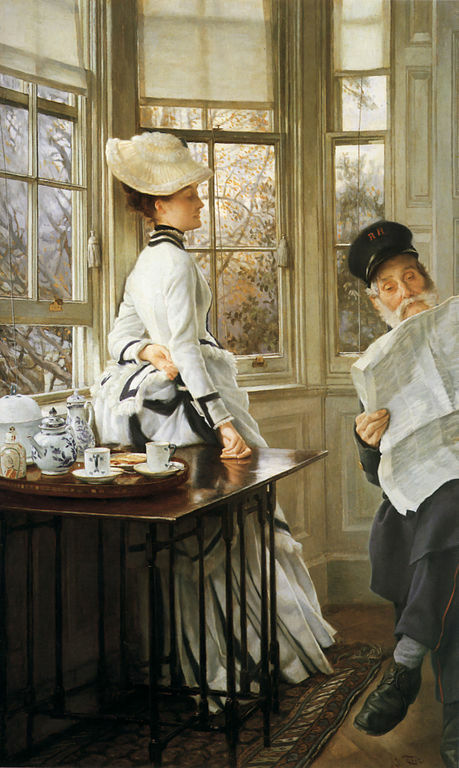 Tissot had imitated Leys’ fifteenth-century costumes, historical architecture and meticulous details. A critic of these medieval scenes wrote, “Stop thief! Leys could shout to the Tissot painting; he took my individuality, my skin, like a thief at night carries off a piece of clothing left on a chair.” It wasn’t until 1864, with Two Sisters and Portrait of Mlle. L.L. that Tissot began to paint modern subjects, but he continued to paint medieval scenes for another year or two as well. At the Hermitage Museum in Norfolk, Virginia with Marguerite in Church (1865), by James Tissot. 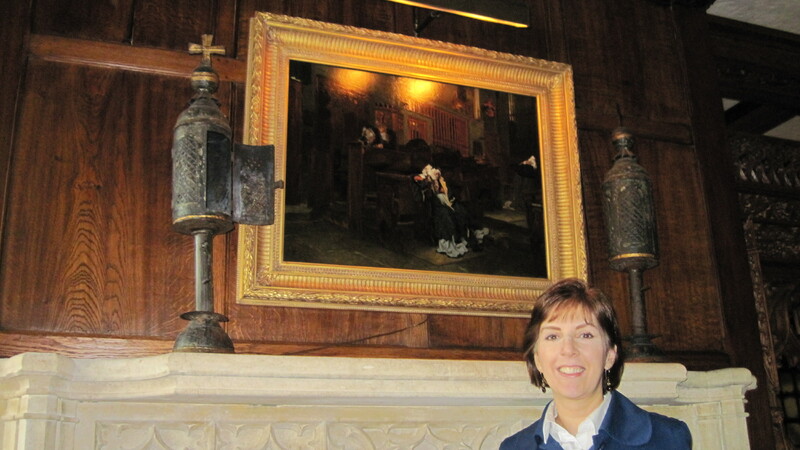 Marguerite in Church, an oil painting on a wood panel, was purchased at Christie’s, London, in 1927. Without a frame, it was a gift for Florence Sloane, the wife of William Sloane, who came to Norfolk, Virginia, in 1887 to work in his uncle’s knitting mills. William and Florence were from wealthy families in New York, where they married in 1893. After his uncle died, Sloane took over three mills, renamed the business William Sloane & Co. and acquired Tidewater Knitting Mill in Portsmouth, Virginia. In 1908, the Sloanes built an Arts and Crafts style house on the shore of the Lafayette River in Norfolk and called it The Hermitage. During World War I, William Sloane’s mills turned out thousands of pairs of fleece-lined long underwear for the Army and Navy while Florence volunteered as postmistress, sewed for the Red Cross, helped at the local hospitals and entertained American, Australian and English troops on the lawn and gardens of her home with cookouts, games and music on summer weekends from 1914 to 1918. The Sloanes entertained as many as 1,800 guests at a time. Mrs. Sloane helped secure the land for what would become the Chrysler Museum of Art in Norfolk, which began as the Norfolk Museum of Arts and Sciences 1926. William Sloane was its first president, and Florence Sloane its first director. Even so, Florence traveled to Europe and built an extensive art collection of her own, which was opened to the public in 1942. You can see James Tissot’s Marguerite in Church – now framed – at The Hermitage Museum and Gardens. In 1943, The Three Crows Inn, Gravesend, c.1873 was purchased for the National Gallery of Ireland in Dublin. This oil study was the basis for Tissot’s 1877 etching of the same title. In 1946, a London journalist, Marita Ross, published a plea for information regarding “La Mystérieuse,” Tissot’s unidentified mistress, the Mystery Woman. Lilian Hervey, then 71, replied that this was her aunt, Kathleen Irene Ashburnham Kelly Newton (1854 – 1882); she had original photographs of Mrs. Newton with James Tissot. At the age of 17, convent-educated Kathleen Kelly married Isaac Newton, a surgeon in the Indian Civil Service, at Hoshearpoor on January 3, 1871. She had been sent from England to India for this arranged marriage, but on the ship, she met a naval officer, Captain Palliser. A week after the marriage, when Kathleen had confessed her association with and preference for Captain Palliser, the couple separated, and Dr. Newton filed for divorce on the grounds of adultery. He funded her return to England later that year, and she gave birth to Palliser’s daughter, Muriel Violet Mary Newton, at her father’s house in Yorkshire on December 20. 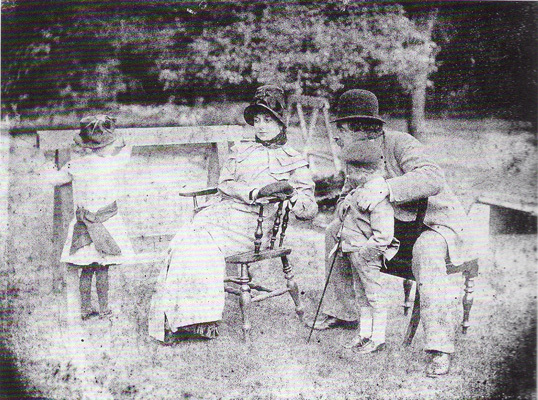 It was about 1876 that Kathleen went to live with James Tissot at 17 (now 44), Grove End Road. 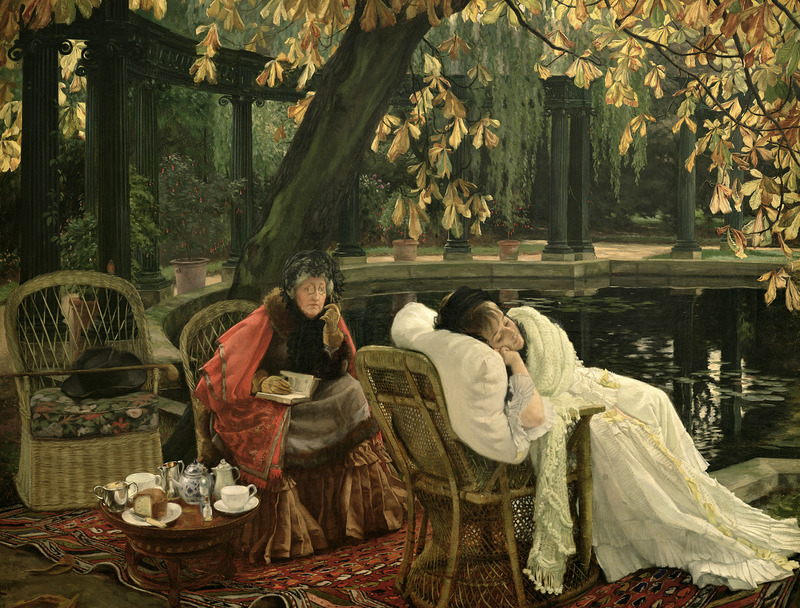 The Convalescent (c. 1876), by James Tissot. Oil on canvas; 30.2 by 39.06 in. (76.7 by 99.2 cm). Museums Sheffield. Courtesy of The Bridgeman Art Library for use in “The Hammock: A novel based on the true story of French painter James Tissot” by Lucy Paquette © 2012. The Convalescent (1875/1876) was exhibited at the 1876 Royal Academy exhibition. It was offered for sale at Christies in 1881, but returned to the owner when the asking price was not received. It later was owned by Andrew Knowles, from whom it was purchased by the Fine Art Society in January 1949 at Christies for £241 10sh. [Andrew Knowles also owned Tissot’s In the Conservatory (Rivals), as of 1887.] Museums Sheffield purchased The Convalescent from the Fine Art Society in June 1949, and it remains in the collection there but is not on display. The painting, which measures 30.2 by 39.06 in. (76.7 by 99.2 cm), is set in Tissot’s garden at 17 (now 44) Grove End Road, St. John’s Wood, London. The model often is assumed to be Kathleen Newton, although Tissot scholar Michael Wentworth (1938-2002) identified her as a professional model Tissot painted in several pictures including Still on Top (c. 1873) and Chrysanthemums (c. 1874-76). Incidentally, a different version of The Convalescent was sold at Christies in 1879. This may be the replica that measures 13 by 8 in. (33.02 by 20.32 cm), sold at Christie’s, London in 1975 for $ 15,286/£ 6,500 and in 1982 at Christie’s, New York for $ 36,000/£ 21,368. Collectors of Tissot’s oil paintings tended to hold on to them in the decades after his death. However, in 1947, his exquisite Reading the News (34 by 20 in./86.36 by 50.80 cm) was sold at Christie’s, London for $ 1,168/£ 290 – surely a bargain, especially considering that, in 1989, it would sell at Sotheby’s, New York for $ 1,250,000/ £ 797,295! 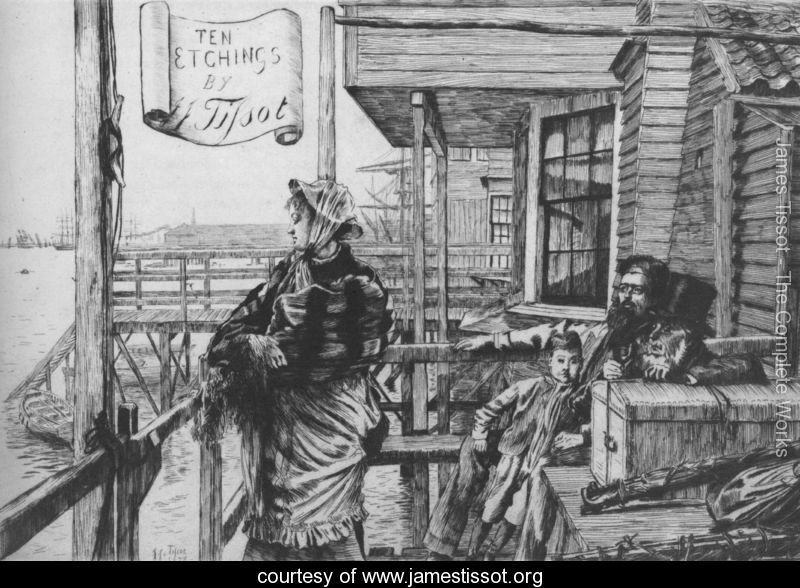 Was Cecil Newton James Tissot’s son? © 2014 by Lucy Paquette. All rights reserved. This entry was posted in Art blog, Art History, Impressionists and tagged James Tissot, Kathleen Newton, La Mystérieuse on June 30, 2014 by Lucy Paquette, author of The Hammock: A novel based on the true story of French painter James Tissot.